When she is not painting in Amsterdam, Jacqueline de Jong cultivates potatoes in France. Amandine, Charlotte, Pompadour, Bintje, Pink Fur Apple, King Edward, Ratte… The list of varieties that she has cultivated since 2004 on her Bourbonnais farm is endless. She undertakes this pastime with no particular intention, almost as a game. Sometimes, according to a quasi-philosophical transmutation, her gardening metamorphoses into art. A few spuds were thus selected to become at once material, model, and subject of her recent series, begun in the 2000s1 – thus reviving the lively methods and tools of a body of work that has been developed since the end of the 1950s, around an emancipatory praxis of form based notably on play, chance, and an interest in so-called minor practices. Born in the Netherlands in 1939, Jacqueline de Jong came into very early contact with a whole host of the artistic and political avant-garde of post-war Europe. She studied art history in the late 1950s, when she became Willem Sandberg’s assistant, the director of the Stedelijk Museum. 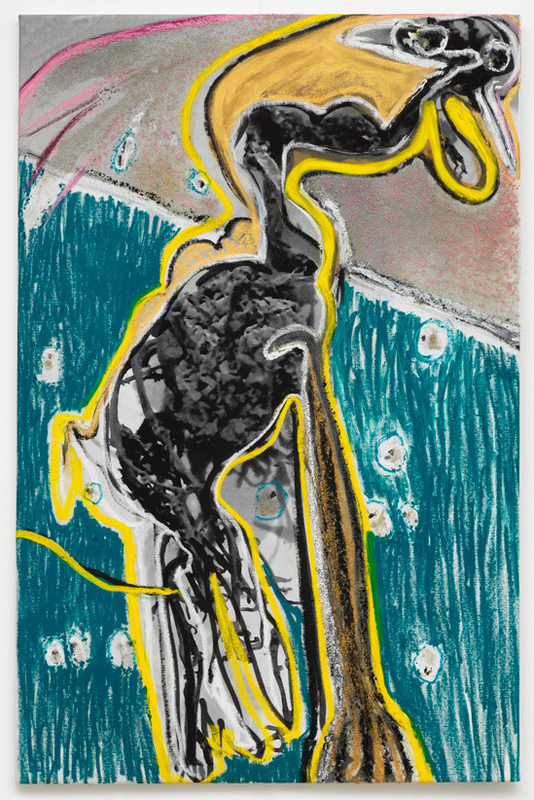 During that period, she became friends with German artists from the Gruppe SPUR and former members of the CoBrA movement, including Asger Jorn, who was her partner. Through the architect Constant, she familiarised herself with the theories of the International Situationists and started to participate in the group’s activities.2 In art history, relating the artistic career of a woman through the men that she has encountered is a bad habit. The procedure is a recurring indication of historiographic phallocentrism that relegates women to the periphery of events (a woman is merely a witness, since she is inevitably the wife of a man or his assistant…). Jacqueline de Jong’s biography would appear to resist this procedure, as her official integration within IS notably attests. Guy Debord made no mistake. “Holland is yours!” he urged in a letter. Charged with developing IS’s establishment in the sector, Jacqueline de Jong thus became the sole member of the Dutch section that she directed. Meanwhile, she moved to Paris and joined the renowned Atelier 17 to learn engraving there. 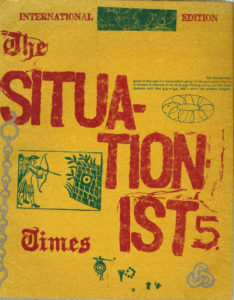 Between 1962 and 1964, in her apartment on Rue de Charonne, she devised the six issues of The Situationist Times, which was among the most important journals of the post-war period, both in form and content. Pervaded by theories of play (cf. Homo ludens by Johan Huizinga), science, and popular cultures, some issues were devoted to a topological concept (such as the knot, the maze, or the ring). 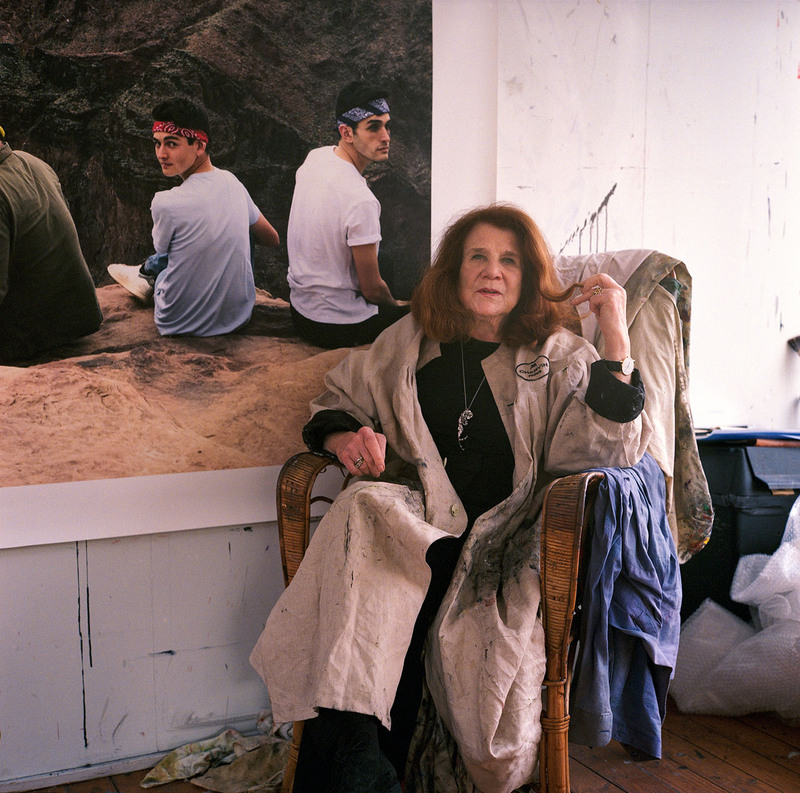 Alongside her editorial activity, Jacqueline de Jong continued her pictorial research. She gradually freed herself of the influence of CoBrA, her palette lightened and her style grew bolder, gaining power, becoming more urban and violent (the Accidental paintings series was begun in 1964 and that of Suicidal paintings in 1965). 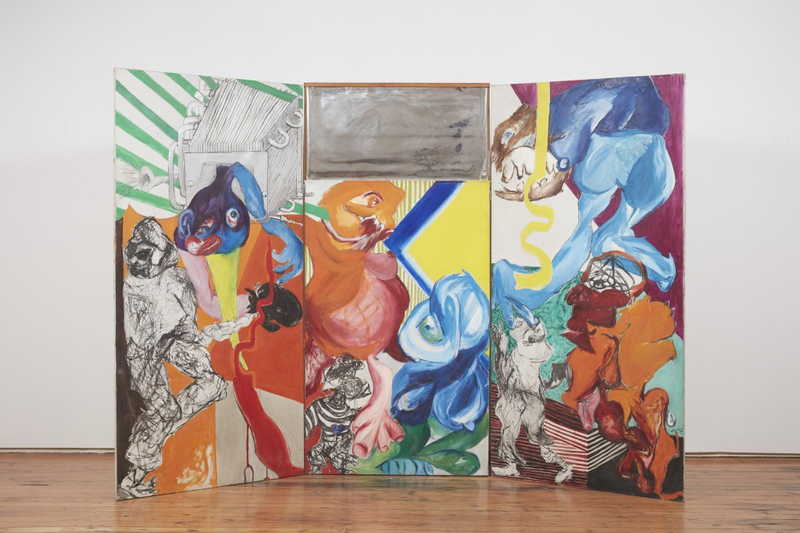 Through her contact with Nouveau Réalisme, then narrative figuration and some American artists such as Peter Saul, her work became immersed in pop culture during the mid-1960s (with references to televisual, advertising, and filmic languages, among others). 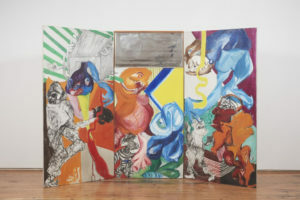 During this time, pictorial composition started to splinter: the surface of the painting became the subject of a topological fragmentation linking up heterogeneous geographical and temporal spaces, announcing the start of a story, as in comic books. This division contributed to a broader reconfiguration of the medium itself, gradually acquiring a sculptural dimension (with, for instance, the use of screens as a painting support in Le Salau et les Salopards (Bastards and Scumbags), 1966). Prohibited from visiting France for having actively participated in the Atelier Populaire during May ’68, Jacqueline de Jong was obliged to move back to Amsterdam. With no fixed studio during this transitional phase, she designed Chroniques d’Amsterdam [Amsterdam Chronicles], a remarkable series painted as diptychs that, once closed, became suitcases that could be easily transported. 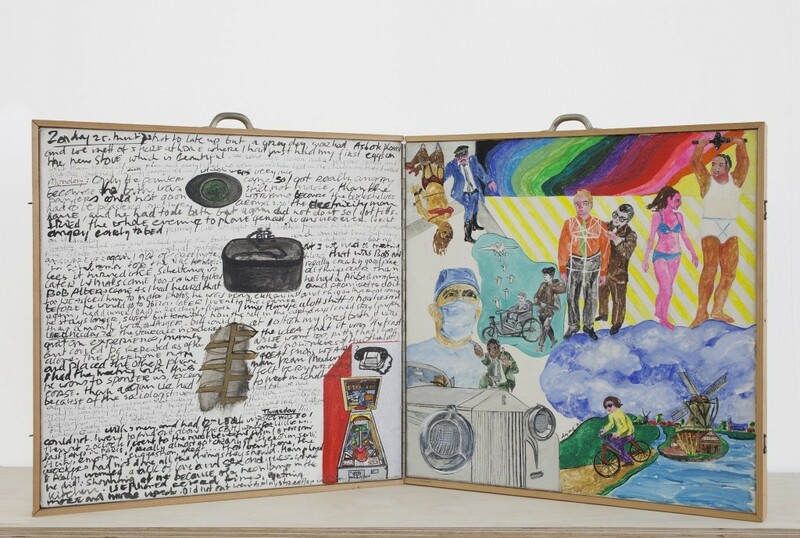 Each of them constitutes the fragment of a kind of diary in which text and image are combined, evoking her daily life, the events and social changes of her age (feminism, sexual liberation, and the Black Panthers, among others). Emblematic of research undertaken by Jacqueline de Jong throughout her series, Chroniques d’Amsterdam [Amsterdam Chronicles] bears witness to an oeuvre that continues to see itself, even now, as a permanent and liberating reconfiguration of registers, formats, discourses, and practices. Born in the Netherlands, Jacqueline de Jong (1939) lives and works in Amsterdam and France. After personal exhibitions at the Moderna Museet in Stockholm (2012) and the Abattoirs Musée – FRAC Occitanie Toulouse (2018), the Stedelijk Museum (Amsterdam) is currently devoting a retrospective to her work. 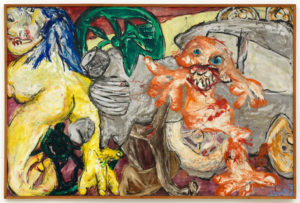 Her works are included in public collections in France and around the world, such as the Cobra Museum voor Moderne Kunst (Amstelveen), the musée national d’Art moderne – Centre Georges-Pompidou, the Bibliothèque nationale de France, the Museum of Amherst University (Amherst, Massachusetts), the KunstCentret Silkeborg Bad (Silkeborg), the Lenbachhaus Museum (Munich), and the Henie Onstad Kunstsenter (Oslo). Her archives are part of the Beinecke Rare Book and Manuscript Library, Yale University (New Haven, Connecticut). 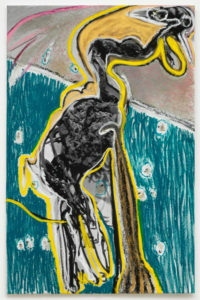 She is represented by the gallery Dürst Britt & Mayhew (The Hague) and the gallery Château Shatto (Los Angeles). The Potato Blues series is a collection of photos of potatoes, printed on canvas with pastel enhancements. They are grotesque stagings flirting with the border between abstraction and figuration. 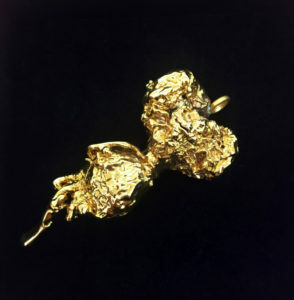 Les Pommes de Jong are pieces of jewellery based on potatoes dried for two years and then covered with platinum or gold. The International Situationist is a revolutionary organisation founded in 1957. It was the result of the fusion of several European entities (Lettrist International, the International Movement for an Imaginist Bauhaus, the London Psychogeographical Association, and SPUR). By way of a critique of everyday life, the IS denounced the alienation of the society of the spectacle and advocated a liberating praxis notably based on the surpassing of art and the realisation of philosophy. Gallien Déjean is an art critic and independent curator. He teaches art history and theory at the École cantonale d’art de Lausanne (ECAL) and at the École nationale supérieure d’arts in Paris-Cergy (ENSAPC). He is a member of Treize, a Parisian production, exhibition, and publishing company. 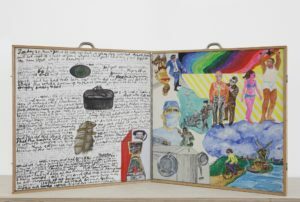 He recently curated the first retrospective devoted to the English art collective BANK (Self Portrait - BANK’s Archives & Relics - 1991-2003 at Treize in 2012 and Elaine MGK, in Basel, in 2013). From 2013 to 2015, he curated several exhibitions at the Palais de Tokyo. In 2018, at the Plateau à Paris, he organised the collective exhibit A Study in Scarlet around the work of Cosey Fanni Tutti. He has published several books as an author and editor. He is currently at work on a catalogue about BANK, which will be published by Primary Information, NY (The Bank Fax-Bak Service). Translated from French by Anna Knight.